Youth Eco Weekend” at the Diocesan Training Center in Maseru Lesotho. 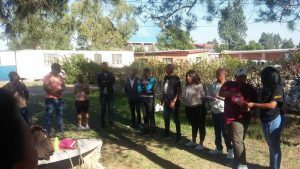 The Diocesan Youth together with the Children Ministry leaders from the Diocese of Lesotho attended the youth Eco weekend in held in Maseru Lesotho. We started the conference with Earth hour praise and worship that was held in the dark were all lights and electric devices were switched of for an hour, as part our repentance for the carbon used for travelling to the event. We took some time to look at the current status of basic survival needs and noted the following: (a) Food security : Africa is experiencing a high level of heat which is causing the land to become more dryer than before, (b) Safe water: tap water not being safe anymore and which is harmful to people, (c) The right to play: kids having to play in illegal dumpsite areas which causes them to get all this illness as they are exposed to harmful waste from our homes. With the high unemployment rate amongst young people and high cost of living, our generation is mostly affected by issues of environment, food has become more expensive due to high volume of dry lands, for the best medical care you need to go to private hospitals as public once are always full and are under staffed, bottom line the poor will suffer the most and with no jobs young people are in the danger zone . Even if they were a planet “B” if we can’t afford a fight to Kenya which is here on earth, imagine the cost of getting to the other planet. We all acknowledged that it is upon us to start caring for creation by doing all we can to renewing and sustaining it. The team agreed that all Diocesan youth/children ministry gatherings will from now on become more Eco friendly events with the theme “RRRE” Reuse, Recycle, Reduce and Educate. Bishop Taaso shared his vision of a Green Diocese where he encouraged young people not only to plant but to start growing trees. One of the young people said: “We need to be people of integrity and walk the talk not only around people but also when we alone at our private spaces”.